I love Korean food. One of the favourite is kimchi. I have always wanted to know how to make kimchi. Recently made a batch it was a success and to make sure it is safe to eat. I tried it, it was fine. Now I am confident to share a fresh batch with you. 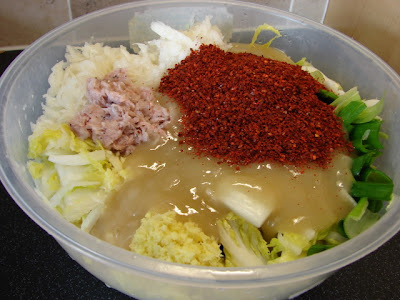 This recipe is a Chinese cabbage (leave) or Napa cabbage Kimchi. To make kimchi there are several essential ingredients. 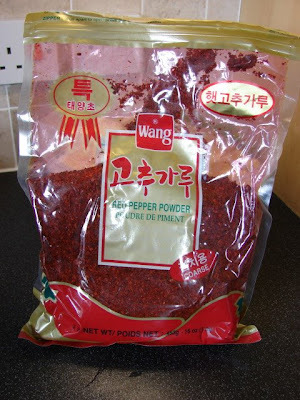 For the chilli powder must be Korean chilli powder which is mild and very deep red in colour, other chilli powder just won't do. I bought this from Chinese supermarket, also available in all Korean supermarkets. 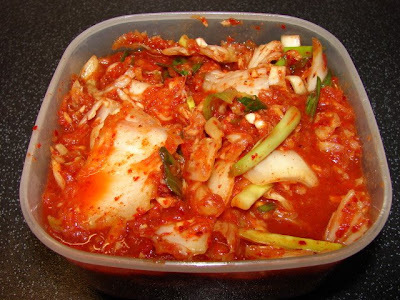 Many kimchi use raw oysters for fermentation and flavour. I won't dare yet not sure if I will get food poisoning using raw seafood to ferment food. Instead I used another Korean ingredient i.e. salted baby shrimps I bought from a Korean supermarket in London. Salted shrimps give a nice (savoury/seafood) flavour than without. This bottle of salted shrimps looks similar to Malaysian salted and fermented shrimps called cincalok. Korean salted shrimps smell a lot fresher and less pungent than cincalok. Another flavouring is fish sauce either Korean or Thai. I used Thai fish sauce. **Vegetarian Kimchi is feasible but not as flavourful, just sub fish sauce with light soy and leave out the salted shrimp. Cut the cabbage into quarter. Sprinkle with salt all over and in between the leaves. Leave for 3 - 4 hours till the cabbage is soft and limp. Rinse with water to remove the salt. Squeeze to remove excess water. Cut the core off and cut the leaves into 2 inches long. Grate the mooli and Chinese pear. Squeeze out the juice. Keep the pulp with the rest of the vegetables. Measure the juice and top up with water to 1 cup. Stir into the glutinous flour till no lumps. Cook this gently till the mixture thicken to a paste. Leave to cool slightly then add fish sauce and sugar, stir. Mix all the ingredients together with a large mixing bowl. Gloves are strongly recommended. After mixing, store in containers. This kimchi is ready to eat straight away, very fresh like a spicy salad. No acidic taste. Freshly made kimchi is quite dry. After a day or two it should give a liquid juice. Can keep in fridge right away. 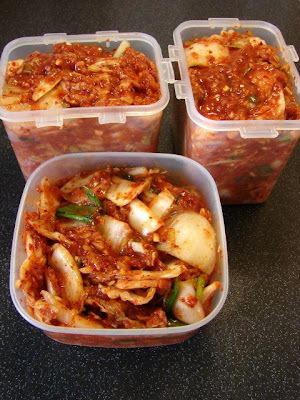 To give a more acidic flavour, leave the kimchi to ferment at room temperature for few hours up to 1 day. Then keep in fridge for as long as you like. It's very tasty don't think it will stay very long in the fridge before you are ready to make another batch. This kimchi has been left on the worktop for about 6 hours, looks a lot more juicier and tastier. Blimey Sunflower I knew you had a vast knowledge of Chinese Cuisine but seeing this blog...I'm staggered. There are people leaving message but was aborted for some strange reason. Testing to see if I can send a message to myself. more discussions about this post on here. This kimchi looks very delicious! 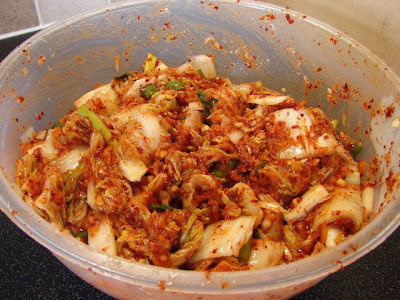 your kimchi looks yummy, will give a go once i get my hands on some of those essential ingredients. The last time I made kimchi was after we returned from our visit to north Korea. Our guide there had told me how to make it! I have to say that it was nothing like the Kinchies we had eaten there. She was the daughter of some well to do party official, hence trusted to mix with us 'foreigners', and had obviously never made it herself. Yours looks lovely, I must try making it. How long could you keep it once ready? Sorry Mamta for the late reply, I had kimchi in the fridge for 2 -3 months still ok, the longer you keep it the stronger the taste and the veg gets a bit softer. Thanks Sunflower. I will try making it after Christmas! Hi Sunflower, very yummy authentic looking kimchi! What is Chinese pear and what is daikon radish/mooli? Do you have a picture of how they look like? Is the daikon radish also the normal white radish used for cooking Asian soups? Thanks! This is korean pear http://media.maangchi.com/wp-content/uploads/2010/04/pear1-590x508.jpg normal (small) size about grapefruit , but you can also get some very big one too, if using Korean pear just use one regular small one. I made a batch of your kimchi a few weeks back, but substituted some anchovey/seaweed stock for the shrimp. It was excellent, I've finally got a tste for kimchi, although it's taken me a few years! 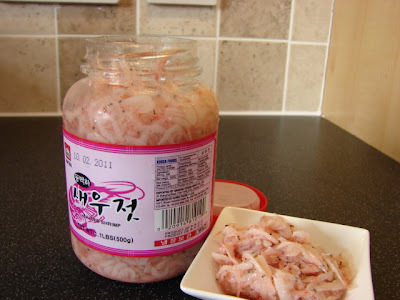 A couple of weeks ago I managed to get hold of some of the shrimp, exactly the same as your jar, from the Korean shop in Golders Green. However I didn't read the label, and I left them out for 24 hours before refrigerating it. It's been in the fridge since, but I'm wondering whether it is safe to use them. The jar wasn't opened, and I see there is a lot of salt in there to "pickle" them, and they still look very pink. Should I use them for the new batch, or throw them away? I would obviously do a smell test. Also what do you reckon of Conference pears from my pear tree instead of the Asian pear? I've got loads this year. Hi Sakkarin, this salted shrimp is heavily salted leaving it at room temperature for a few days should be ok if too long it will start to ferment you will notice lots of air bubble or gassy when you open the jar. I stop using pear juice I find the juice oxidised fairly quickly making the kimchi turning brownish red. I don't find pear just juice is a must ingredient. While you are here can you check my account on your food board. I cannot login properly it accepts my password but it soon changes the screen asking to login again. That is why I don't post there anymore. Thanks Sunflower. only just realised you'd answered. Coincidentally I am just about to make a new batch, two cabbages worth this time, and I even found a proper Asian pear at my local Oriental shop! I don't know why the foodboard is mucking you around, I will reset the password and mail you the details so you can log in.